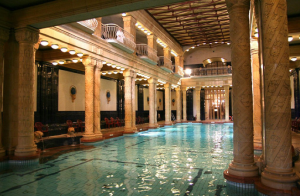 Gellert Spa towel purchase with fast track entry and hotel pickup. Make the most out of your Gellert Spa visit with the Bath Kit package, and have a truly relaxing day in the beautiful thermal pools. Avoid the queues at the towel rental facility, and book this unique Gellert Spa package online in advance. The Single Taxi Transfer (from Hotel to Gellert Spa) is available between 8.30am and 5pm. Check-in at the Baths is between 9am and 6pm. Please add your preferred pickup time in the booking form. Please book min. 1 day ahead. Same day Bath Kit bookings cannot be guaranteed. I’ll visit Budapest from 15 to 18th December and I would like so much to relax in our fantastic Spa. I would not to plan every single hour of my days in Budapest but at the same time I would like to know if It’s better to book entry Spa or I can decide last minute? you can buy your entries on the spot, however, we suggest the online bookings as you can skip the main queue and check in at our HelpDesk. You can book your tickets online on the same day as well a you receive the confirmation email immediately via email. I have booked two spa tickets in May, I was wondering if I am to receive an email confirming this? But i have a submission problem with the address of hotel for pickup. I would like to confirm that your booking is valid, and the confirmation email has automatically been sent to your given email address. Towels can be purchased online, if you choose the Gellert spa Bath Kit. I was reading about the Gellert Spa Bath Kit and a window poup telling to check also the ” Voucher Remainder Fee”. Whats is this Voucher Remainder Fee? Please ignore any pop up window. The voucher reminder fee does not apply to you.